Embryologist Tom Turner was recruited to Austin in 1993 by Dr. Thomas Vaughn, the Texas Fertility Center founder who established the city’s first IVF program at St. David’s. As Director of Austin IVF (now Ovation Fertility Austin), Tom oversaw the growth of the lab to employ seven embryologist and increasing the number of IVF cycles from 95 in 1993 to over 2000 in 2016. 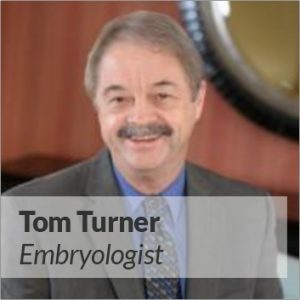 Tom’s career began at Human Embryology’s infancy in the early 1970s. He was the embryologist who performed the world’s first GIFT (gamete intra-fallopian transfer) procedure at the UT Health Science Center in San Antonio. In addition to running several successful IVF laboratories, Tom has served in national leadership positions and as a consultant to IVF programs worldwide.